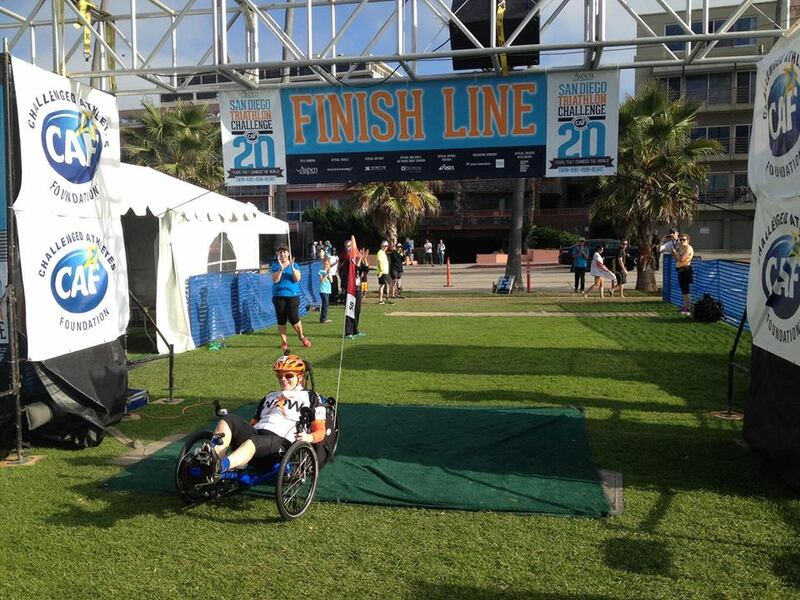 I participated in the San Diego Tri Challenge on October 20th, cycling the bike leg of a relay team. Those 44 miles of Southern California were tougher than any Century I’ve ever done. Including the 1st day – AKA the first 100 miles – of the Lone Star BP MS 150, which goes from Houston to La Grange (and then goes on, the next day, to finish right by the State Capitol in Austin). I’ve never been more proud of crossing a Finish Line. I really really really hate the expression on my face in the photo below, but I have to share it, because it proves that my Finisher’s Medal was draped around my neck by none other than Sarah Reinersten, who is such a SuperStar, and whose story – In a Single Bound: Losing My Leg, Finding Myself, and Training for Life – inspires me immensely. There were pre-events leading up to the SDTC, and I relished the opportunity to meet other challenged athletes. There was a picnic on Thursday, where I met so many amazing athletes & their families. I met Abel Rose, the boy I wrote about in my last post. And I met Mei Mei, who at 7 years old is already taking 1st Places in youth triathlons. 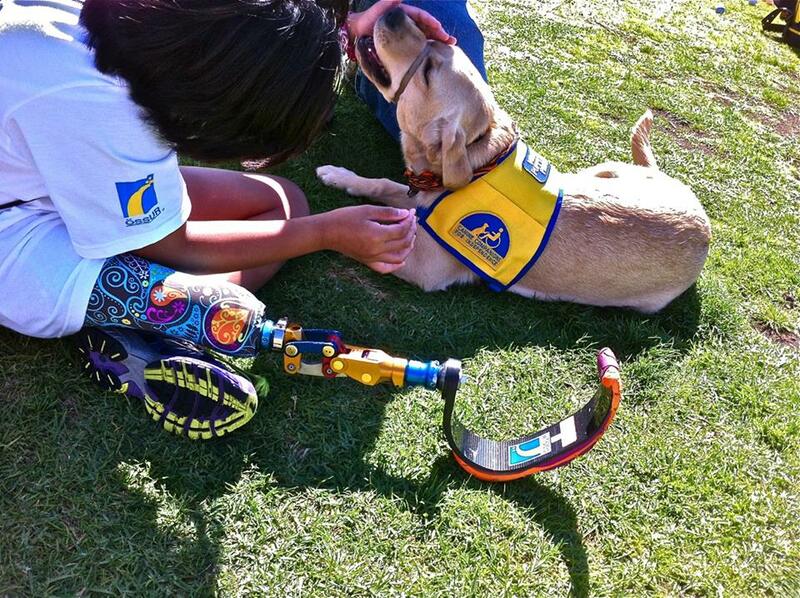 She’s an above the knee amputee with a prosthesis (thanks to Challenged Athletes Foundation!) 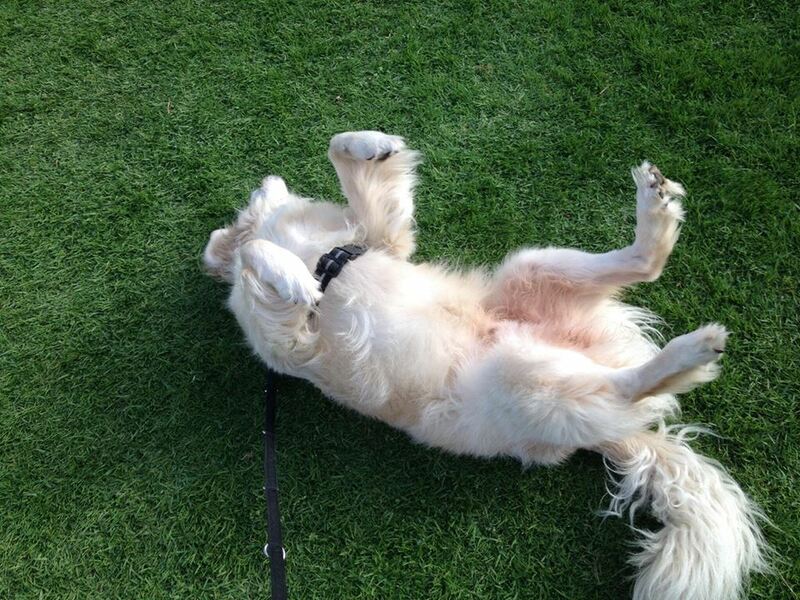 that allows her to run competitively. Mei Mei made friends with Luke the Wonder Dog & then helped with some hands-on socialization training for this apprentice service dog. — at La Jolla Cove. The art on her running leg was absolute visual poetry. Mei Mei herself was – is – poetry in motion. My recumbent trike brings me freedom, independence & bliss, a way to stay as healthy possible, and to keep moving for as long as possible. I know it may be hard to believe, but these wheels have changed my life remarkably, transformed the way I feel about a body partnered with illness & disability, a body mired in pain & fatigue. Being a part of Challenged Athletes Foundation gives me a way to help others who need a way to go from stuff-of-life living to joy-filled living. 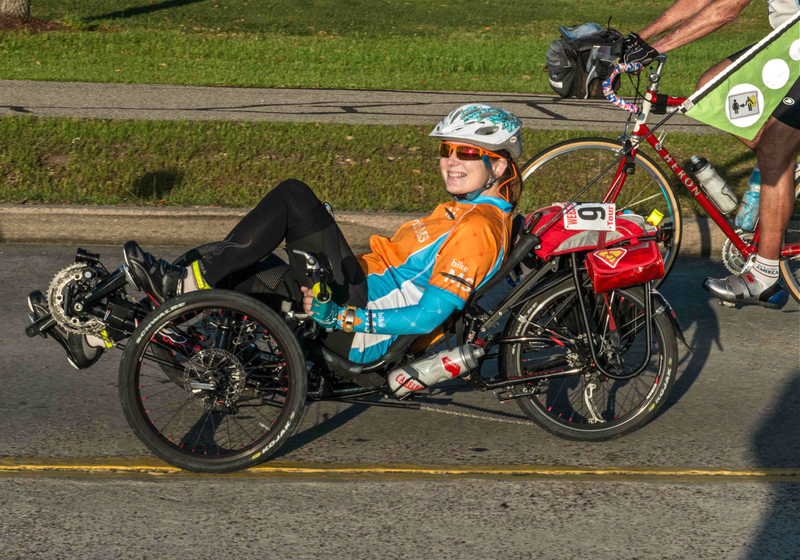 The right piece of equipment – a racing wheelchair, a cheetah leg, a recumbent trike – shifts your focus, from what you’re no longer able to do, to all that you can do. Kids, veterans, anybody & everybody living with illness and/or disability who desires to get moving, and to move themselves fast enough to chase dreams – those are the people CAF enables, with opportunities, grants & scholarships, the just-right match of adaptive equipment, state-of-the art prosthetics, training, motivation & mentoring. 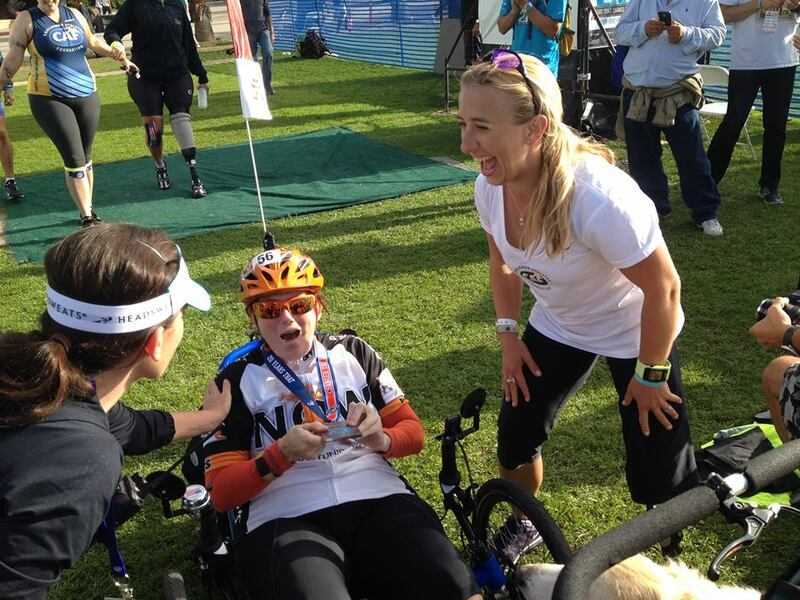 I love my extended family of Challenged Athletes Foundation so dearly, and I am deeply & forever grateful for the experiences afforded to me through being a part of the San Diego Tri Challenge. I will be there again next year! 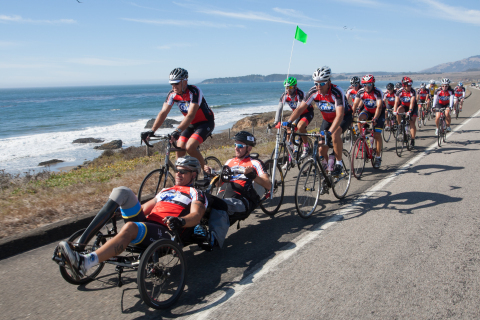 Though I won’t be arriving into San Diego by plane in 2014; I plan to be riding in from San Francisco as part of the Million Dollar Challenge. 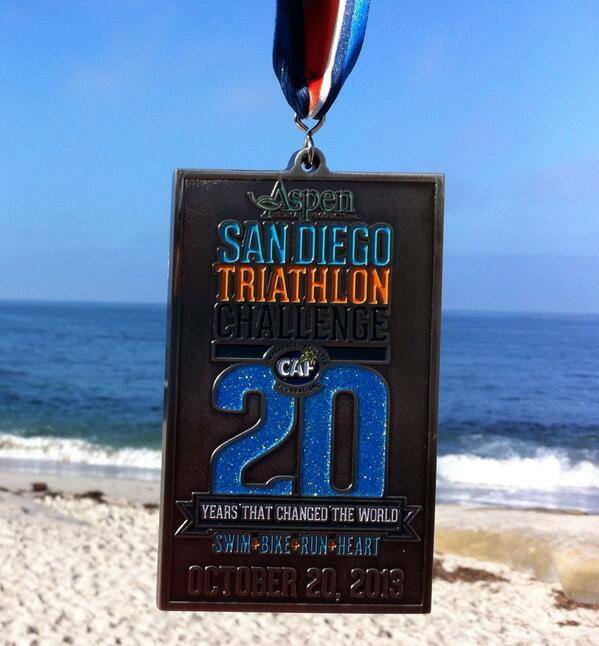 I have more photos & stories from SDTC to share with you later, but in the meantime, check out my new bling. Next to my trike, it’s safe to say that this shiny, sparkling, colorful, firework-beauty is officially my most prized possession. I registered for the 2014 Lone Star Bike MS, which will be my 4th Bike MS event. Woohoo!